I do not see anything here on how to defend myself with a knife. Is not that part of your competences? Haha, .. good joke. One of the worst things is the misconception that you can successfully defend yourself against a knife attack. 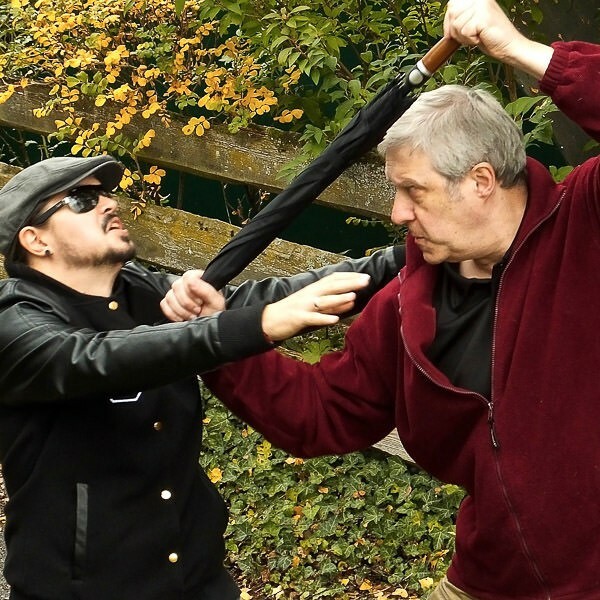 Whether umbrella, baton, karate, Kung Fu, Krav Maga or whatever. Only last year, two kickboxing world champions were stabbed by a drunk in a restaurant. Many people have the image of the "movie villain" in their heads. These are the attackers, who hold the knife high above their heads and then walk towards the victim with dramatically slow steps. Or the other department; these are the ones who stop about two meters in front of the victim and start playing with the knife under threats, to then - again dramatically slow - approach them. Unfortunately - the reality is different. Ask a policeman what he does when someone threatens him with a knife. Rely on his training? No. He pulls out his weapon. Why? Because someone who has a knife in their hands and is perhaps still practicing it is a deadly danger. How would it go in reality? Someone who attacks you with a knife will inconspicuously come as close as arms length or less towards you, having the knife covered well. Then he will hold you with one arm and stab you with the knife again and again - in the quickest order. That's it. In "expert circles" this is called "the sewing machine". You will die. Just bleed to death. Some faster, some slower. But you will die. Pretty much all self defense systems will tell you that only their system can teach the successful techniques. You - all of us - have to cope with the fact that there are situations that are deadly. That there are dangers that we can not control. Only - if you ever get into such a situation, do not even try to be the hero. Run away. As fast as you can. And as far as you can. We are very interested in your comments; feel free to discuss with other readers and us. Do you have a question for our instructor Robert Amper? Send them by email to chiefinstructor@security-umbrella.com; he will gladly answer them here for all readers.